Many of the pieces of art which I own are from the last century or even earlier. They inspire in me a desire to visit the places which they portray but I also realise that those places will have changed. That change is extreme at times and sites may hardly be recognisable. My research into the history and what these places now look like does not lessen my desire to visit them. This lovely pulpit is, I believe, the external pulpit of Notre-dame Cathedral, St. Lo. Few cathedrals have an external pulpit. 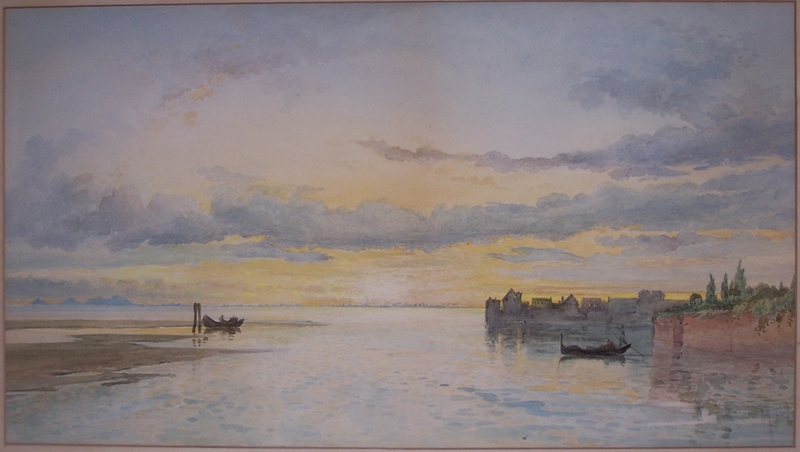 The painting dated 1852 certainly shows a time of prosperity and peace. The pulpit was saved from demolition by Victor Hugo in 1863. St. Lo is named after Saint Laud, Bishop of Coutances. Its history is complicated by conflict and destruction. From the Vikings, to the English (twice), to the Huguenots and finally the Germans in WWII St. Lo has seen its’ share of war and devastation. St. Lo was destroyed in the ‘Battle of Normandy’ and was named by Samuel Beckett as ‘The Capital of the Ruins’. Estimates say that 95% of St. Lo was destroyed. A devastation extreme. Notre Dame church was among the few standing buildings after the bombings by the Allies in June and July 1944. Its roof and facade were destroyed, as well as one of its two towers and the top of the second. The church was partially restored after the war: the facade was rebuilt as a plain wall. A place in which history and modernity are juxtaposed with a view to remembering the past while leaning toward future. The next watercolour is once again not quite what you might expect to see if you went to the place portrayed. We see here Giudecca, Venice. Giudeccas history is one of palaces and gardens. Industry came to the island in the twentieth century with shipyards and factories and even a film studio. It is now exclusively a residential area. It is known for its docks and its churches. Industry has not yet come to this place in 1895. It is a place of gondolas and calm seas. A place where one travels by water not land. Where ones livelihood is connected to and centred on the water. Whether this is a sunrise or sunset, I cannot tell but beauty lies here. A calm restfulness infuses this picture. I choose to believe this a sunset but you can decide for yourself . It shows in the depiction of the sea a coming of the impressionists style. With a few deft strokes a gondolier is created by this artist but for me its main beauty lies in the light. How all is drawn toward the central brightness. It pulls you in, taking you past the gondolas, past the harbour buildings to sail into, no, to float into the light. Creating in you the desire to see what is in the light, what is beyond. the light. 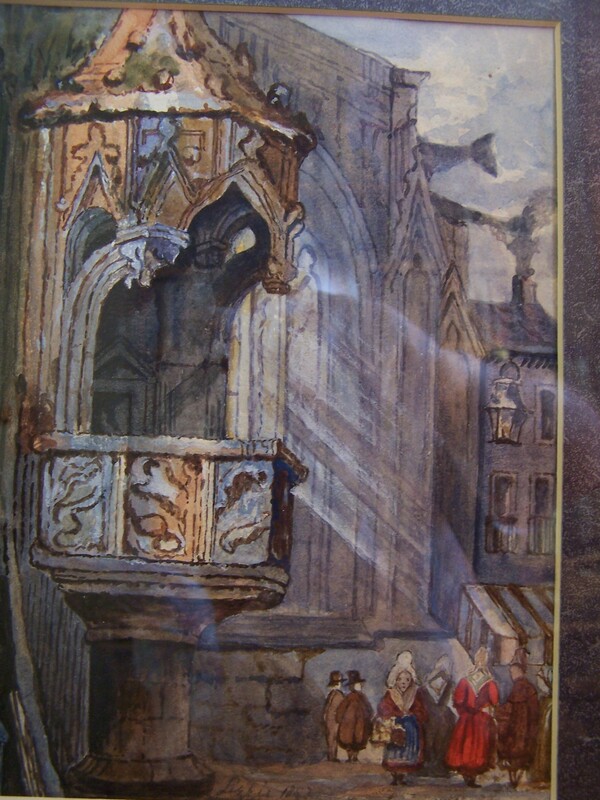 This entry was posted in Watercolour paintings and tagged gondola, gondolier, Guidecca, harbour, Notre-Dame cathedral, pulpit, St. Lo, sunset. Bookmark the permalink.